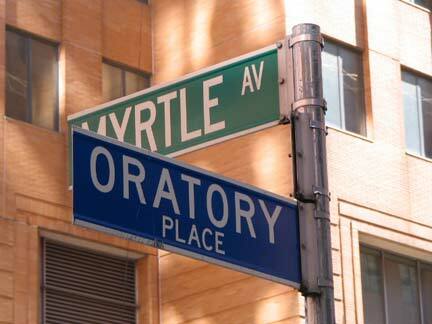 I hadn’t walked a considerable length of Myrtle Avenue in Brooklyn since 1965. That year I distinctly remember some aspects of a walk my mother and I took down Myrtle, one of the lengthiest avenues in Brooklyn and Queens. 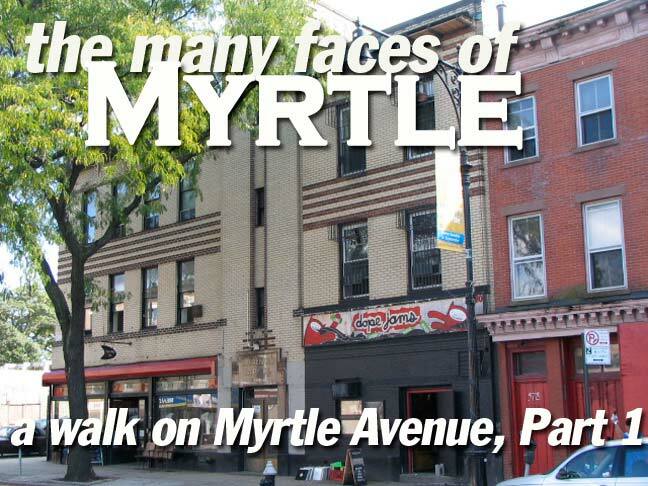 In those days, and right on into the 1980s, a walk down Myrtle was a somewhat dicey proposition, with or without an elevated train shrouding it. About all I remember was “My Boy Lollipop” playing on a car radio. We completed our errand eventually, and didn’t take the el back — I would have remembered that. Myrtle has gotten somewhat safer since, and your webmaster can skulk around with a camera in the broad daylight without being attacked. Or at least I wasn’t on this walk. When my parents and I would make a pilgrimage to A&S on Fulton, or my father and I would visit one of his favorite camera stores on Willoughby and Lawrence (long-vanished now), I would remember gazing somewhat forlornly at that mysterious el structure a block north, on Myrtle. Except for that one fleeting sojourn in 1965, I never experienced that el, whether riding on top of it or walking under it. 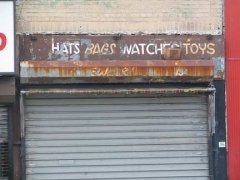 In three separate trips dating to the summer and fall of 2009 and February 2010, I walked the length of Myrtle Avenue, and the whole way, the ghost of the el hovered o’er, if inanimate objects could have ghosts (and I don’t believe animate objects can become spooks either). 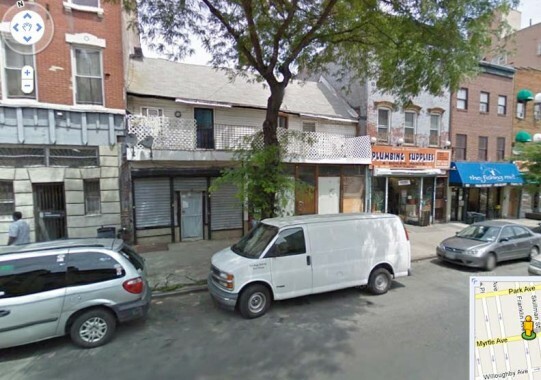 The $2 history of Myrtle Avenue: it was first laid out in 1835 from Fulton Street as far as Cripplebush Road, an ancient Kings County track now largely replaced by Bedford Avenue. 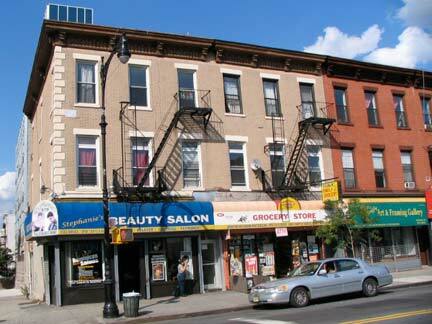 It was extended in 1839 to Brooklyn’s Broadway, and again in 1854 as the tolled Jamaica Plank Road out to Jamaica. (Most of NYC’s toll roads of this type were made “free” around 1890-1900.) 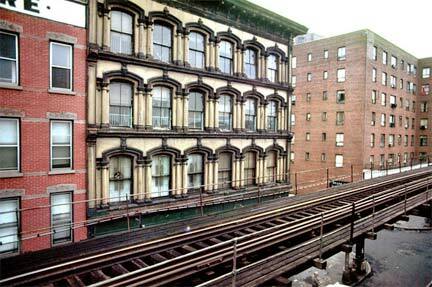 Horsecars appeared on Myrtle in 1854, which later became trolleys taking electric power from overhead wires. 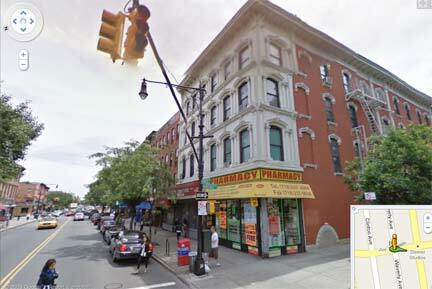 The infamous El shrouded Myrtle from 1888 to 1969 — at first as far as Grand Avenue, to Brooklyn’s Broadway early in 1889, and to Wyckoff Avenue later the same year. 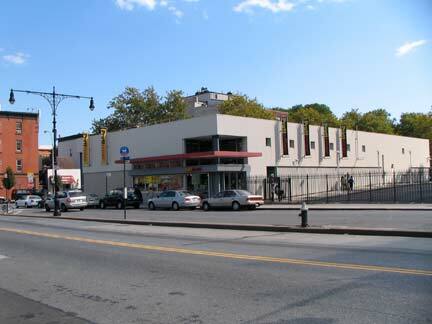 The structure reached its current terminal, Metropolitan Avenue, as a surface line and it was “ellified” in the 1910s. 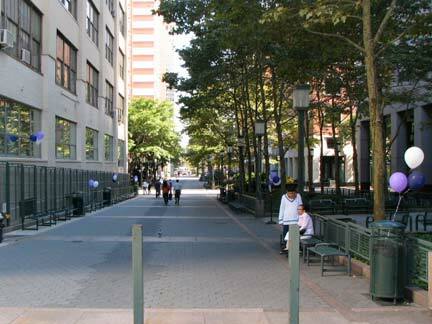 The western end of Myrtle Avenue between Fulton and Jay was eliminated for courthouse construction and Cadman Plaza in the 1950s, while the stretch between Jay and Flatbush Avenue Extension became part of MetroTech Center beginning in 1989. A 1929 Belcher Hyde atlas shows the pre-1940s configuration. 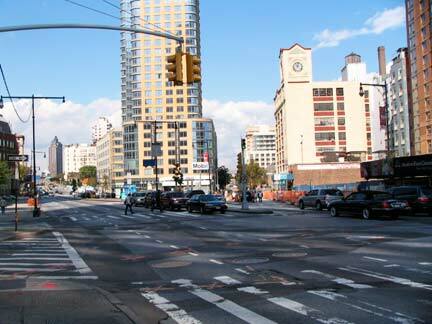 Myrtle Avenue, at its western end, once met Fulton Street at Washington, Court and Montague Streets in a grand plaza that faced Borough Hall. 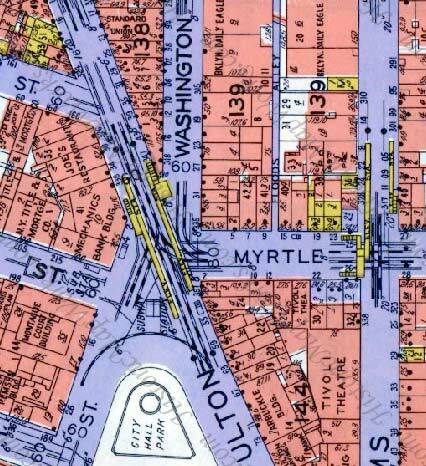 One block, and only one block, was illuminated by direct sunlight, as the Myrtle El swung east from Adams Street at the right side of the map. 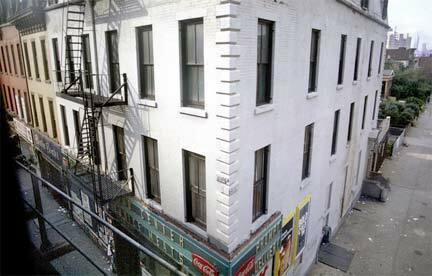 A narrow alley called Floods Alley once ran between Myrtle and Johnson, one block to the north. 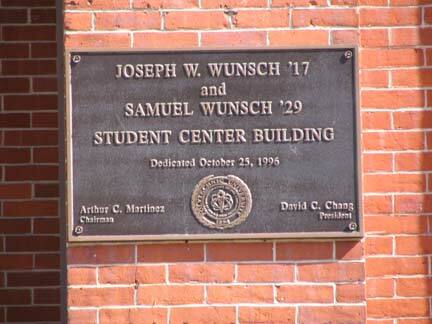 This space is now occupied by courthouse buildings. 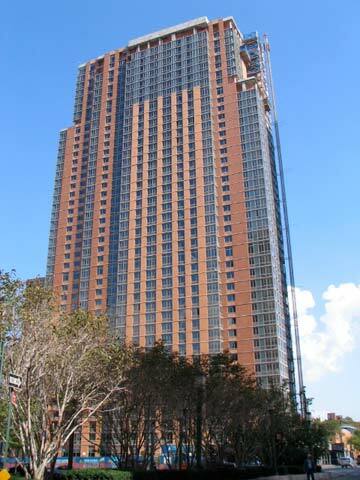 Between Adams and Jay, the former path of Myrtle Avenue is now occupied by the Brooklyn Renaissance Center and the New York Marriott at the Brooklyn Bridge (its official name). 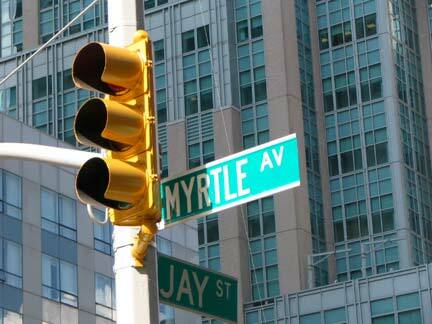 Since the late 1940s Jay Street has been Myrtle Avenue’s beginning point. 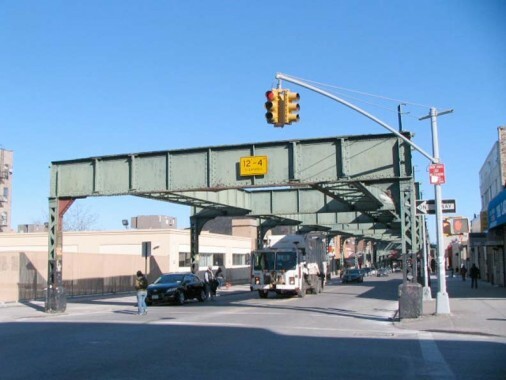 The el was cut back to Jay Street after its run over the Brooklyn Bridge was severed in 1944, with a direct transfer instituted to the then-recently constructed IND lines under Jay. 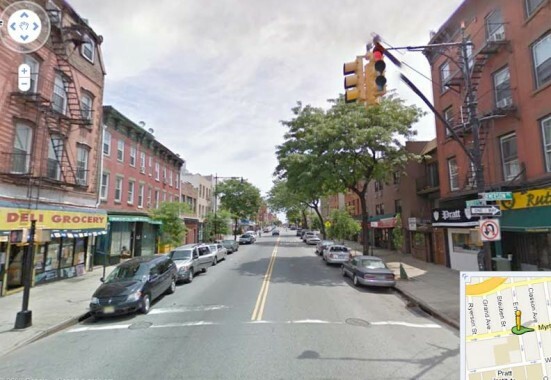 Same location, looking east on Myrtle Avenue from Jay Street, 1971 and 2009. There is just one building in photo left still standing, 6 Metrotech Center, Rogers Hall of New York Polytechnic Institute; it appears at the left in both pictures. The other buildings were demolished in the 1980s to make way for the new MetroTech center, and prior to early 1970, everything would have been impossible to see from this angle because of the Myrtle El. 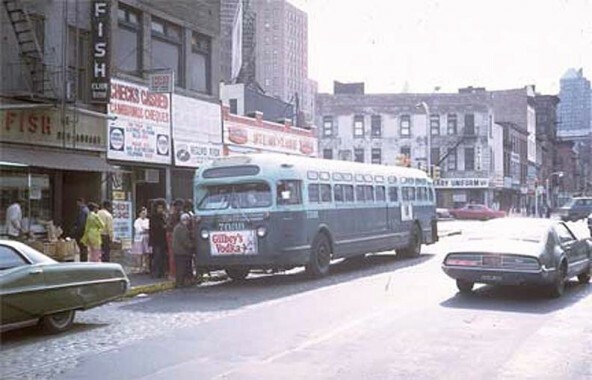 A battered GM bus, on one of its last runs, plies the B54 route between Downtown and Wyckoff Avenue and Palmetto Street in Ridgewood, where the L, J and (as of early 2010) the M trains are running. 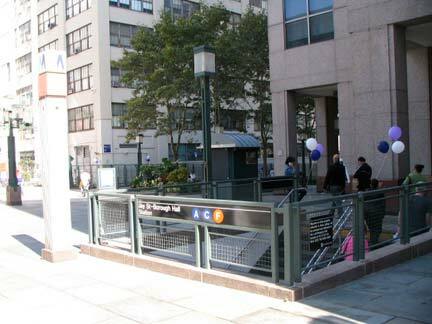 5 MetroTech Center – Polytechnic Institute of NYU Dibner Library, constructed 1992. 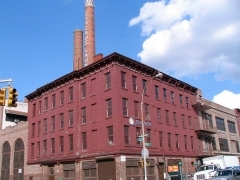 Poly Tech was founded in 1854, with its first building at nearby 55 Livingston Street. 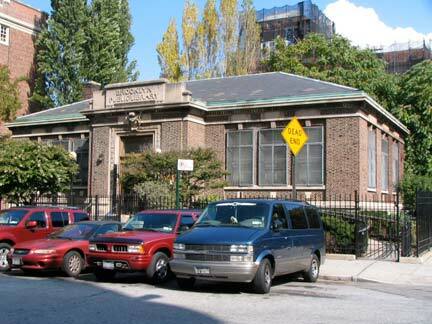 Its preparatory school program was re-established as the Polytechnic Preparatory Country Day School in 1917 in a distinctve 4-sided clock-towered building in then-rural Bay Ridge at 7th Avenue and 92nd Street. 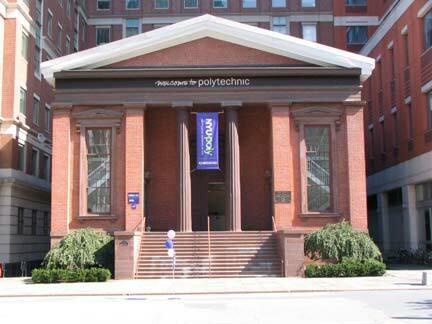 Poly Tech moved to its present complex of buildings at 333 Jay Street in 1957, and in 2008 began its affiliation with New York University. 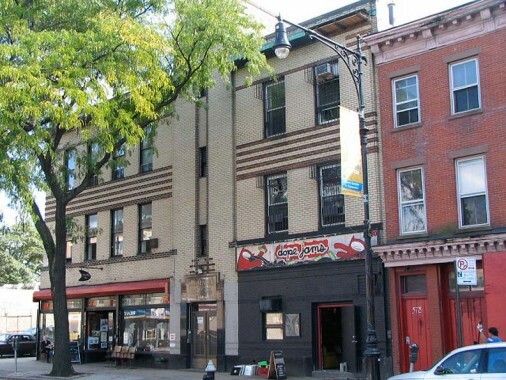 The Wunsch Student Center Building, Bridge Street, was formerly the Brooklyn African Wesleyan Methodist Episcopal Church, located in this 1847 Greek Revival building. It provided sanctuary for fleeing slaves before and during the Civil War and blacks escaping the Draft Riots of 1863. 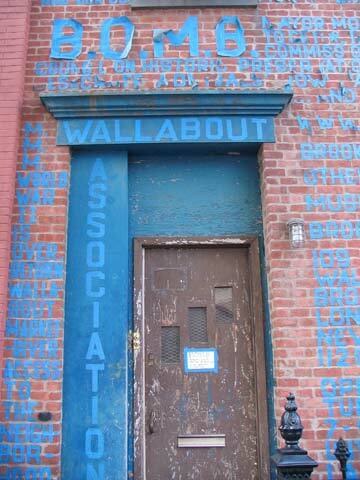 As the AWME it was the first black congregation in Brooklyn. 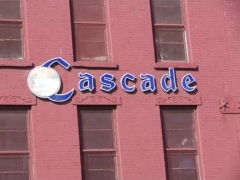 It spent a few decades as a postcard factory. In the 1990s it was incorporated into Metrotech and underwent full restoration. 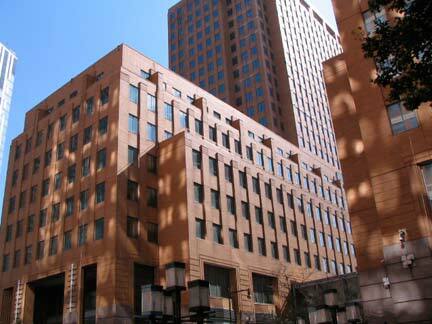 4 MetroTech Center, completed by Skidmore, Owings & Merrill in 1993 on the southeast corner of the MetroTech complex. 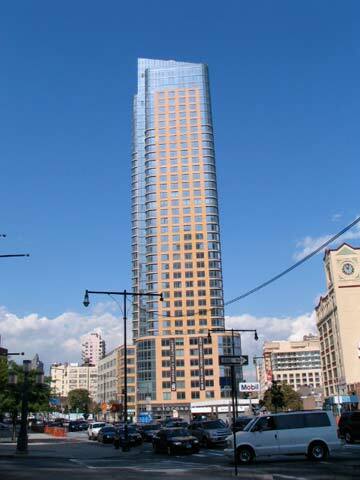 It’s primarily occupied by JP Morgan Chase, whose logo crowns the building. I didn’t have time to visit Duffield Street, but I did on July 4th, 2007 — the street, named for one of a colonial-era physician in Brooklyn Village, is dotted with venerable buildings that once harbored the Underground Railroad, as well as the Oratory Church of St. Boniface, for which Oratory Place at Duffield and Myrtle is named. 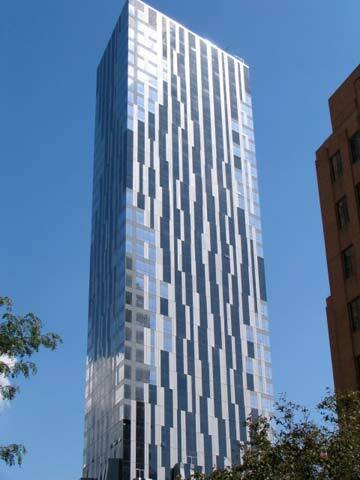 and Toren Condo. 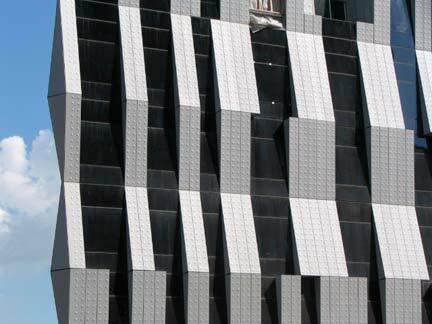 Avalon is a rental building, while Toren, with its unusually “riveting” facade, contains condominium units. 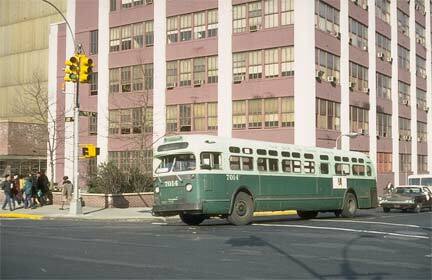 A GM bus heads east on Myrtle Avenue at the Flatbush Avenue Extension in 1971. Oddly enough, some of the buildings shown in that photo hung in there until about 2008, when they were finally demolished to make way for the Toren condo building. 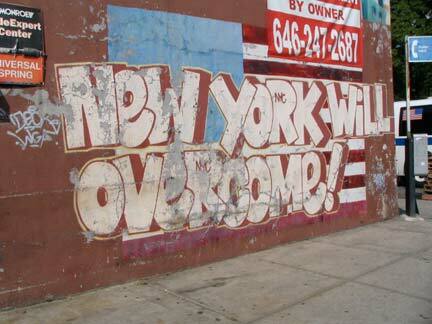 Top photo from NYCSubway bus photo collection. 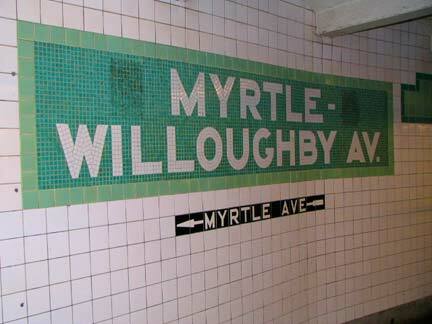 Note some of the Belgian block paving still showed on Myrtle in the 1970s. 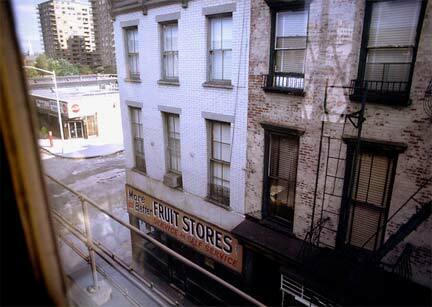 The buildings across the street on the FAE are long gone, with 4 MetroTech now occupying the site. 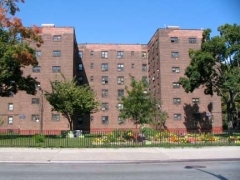 The Raymond Ingersoll Houses and Walt Whitman Houses, fronting the north side of Myrtle Avenue between Prince Street and Carlton Avenue, as well as the University Towers Houes and Kings View Houses on the south side, tend to act as a buffer between the gentrification of southern and eastern Fort Greene from migrating to the north. 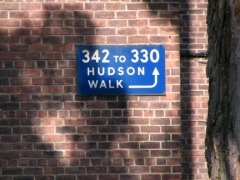 Hudson Walk, in the Ingersoll Houses, follows the path of old Hudson Avenue. 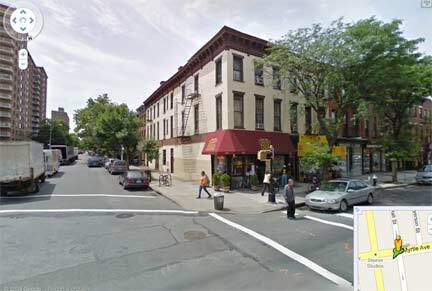 At this point the old 5th Avenue El turned south and headed for Bay Ridge via Hudson, Flatbush, 5th and 3rd Avenues. That el was torn down in 1940. The blue and white enamel signs on the Ingersoll Houses are the originals from the 1940s. The Church of St. Michael and St. Edward (one saint per tower, supposes your webmaster), St. Edwards Street north of Myrtle, was built in 1902 by architect John Deery as St. Edward Church. 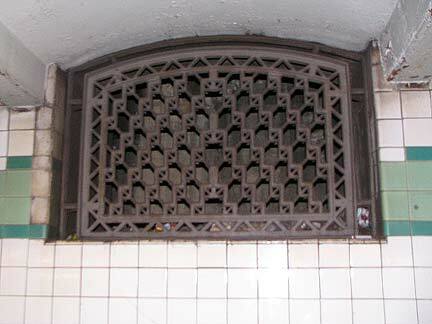 Its claim to fame regarding the Myrtle Avenue El is that you can still see the el when you enter! The church replaced its altar in 1972 with a new one built with a few of the old girders spared when the Myrtle Avenue El was demolished. Talk about your holy relics. 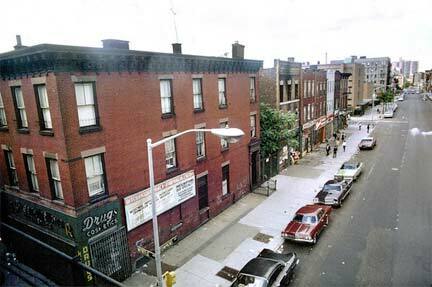 This terrific picture of the twin-towered church was shot in 1969 by Forgotten Fan Pat Cullinan as part of his Myrtle Avenue el series. 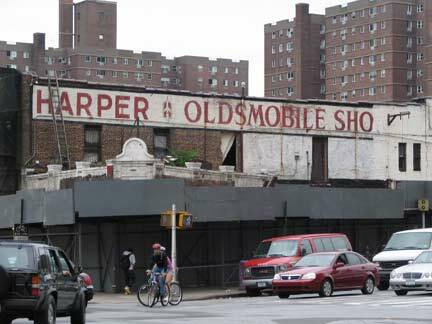 I have already featured it on an FNY page, and I’ll be liberally using the amazing pictures here as way to compare and contrast the Myrtle Avenues of today and yesterday. Pat’s comments can be seen on his own page. This is St. Edwards Street, which pretty much looks the same today, though there’s more shade and the hedges have gone. A small chunk of the region’s former street layout, St. Edwards street and Auburn Place, was allowed to remain amid the big Corbusian-esque hosuing projects that went up mid-century. 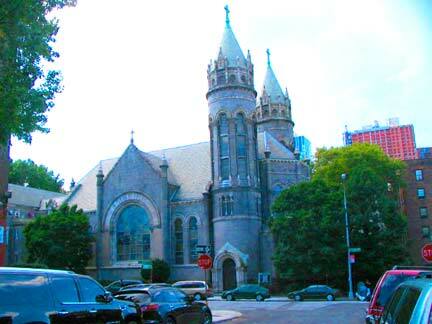 The reason was the existence of the church, as well as the Walt Whitman branch of Brooklyn Public Library, one of the many libraries built in the early part of the 20th Century thanks to a grant from steel magnate and philanthropist Andrew Carnegie. 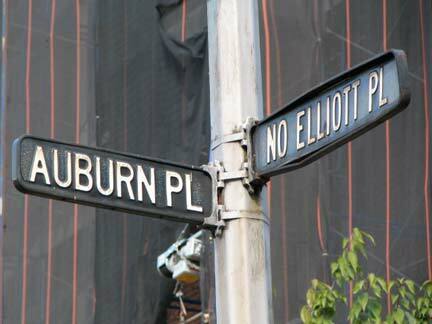 The Department of Transportation is likely unaware — as yet — of the two porcelain enamel and metal street signs that mark the former intersection of Auburn Place and North Elliott Place (which these days is confined to a one-block stretch between Park and Flushing Avenues. Myrtle Avenue forms the northern boundary of Fort Greene Park between St. Edwards Street and Washington Park (Cumberland Street). 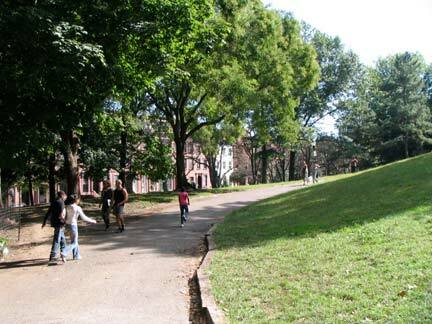 The park was once known as Washington Park and was built in 1847 on the former site of Fort Greene, formerly Fort Putnam. It was renamed Fort Greene Park in 1897, with only the section of Cumberland Street on the east side of the street retaining the old name. 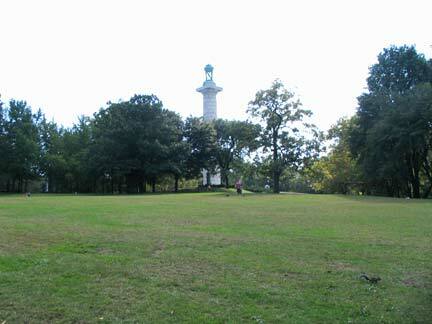 I am more detailed about Fort Greene Park on my Willoughby Street FNY page. Miles to the east, Myrtle Avenue runs through Forest Park. 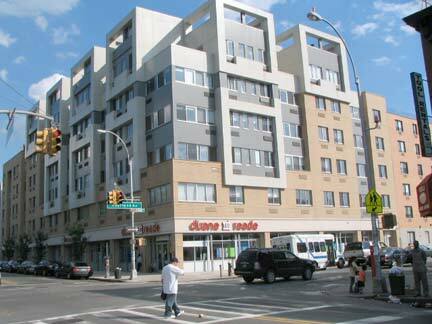 Clermont Avenue at Myrtle. 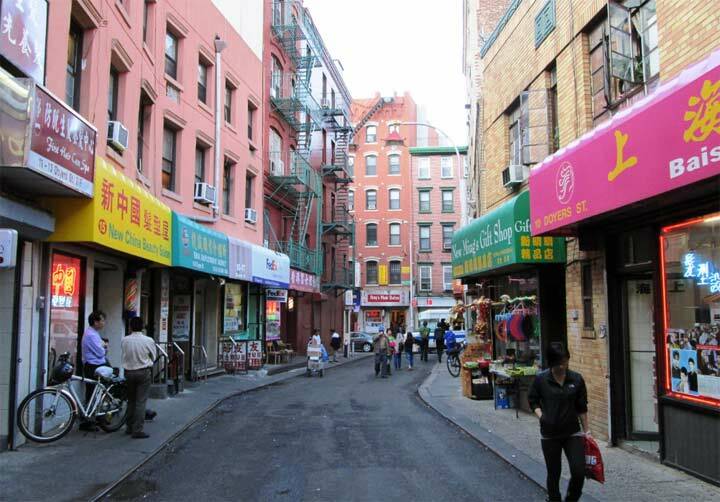 The cross streets were carved into the corner of the building, a common practice before street signs were hung on lampposts. 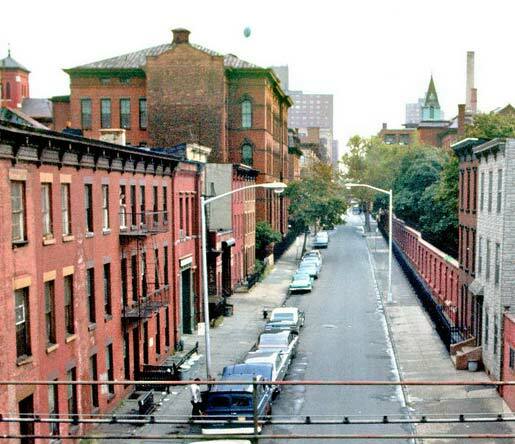 Vanderbilt Avenue at Myrtle in 1969, from the Cullinan collection, and a shot from Google Earth of the same corner today. There’s a liquor store there, same as then. Do I crib from Google Street View? You bet I do, and I enjoy it. Nothing beats getting the shot myself, but in cases where I don’t, or it’s impossible to get a good shot, I’ll turn to the service. I’m not sure how Rand McNally and Hagstrom are going to cope, between this and GPS. 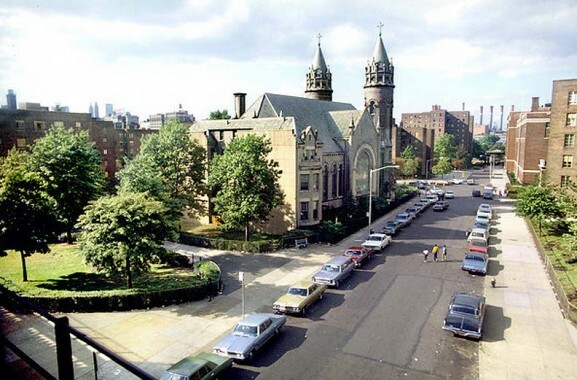 Pat Cullinan got some additional photos of Vanderbilt north of Myrtle, but I won’t compare old and new as Vanderbilt is now lined on both sides with street trees, as it wasn’t in 1969. In fact I get the impression that there were vastly fewer street trees then. How did we all breathe, between that and the pollution? 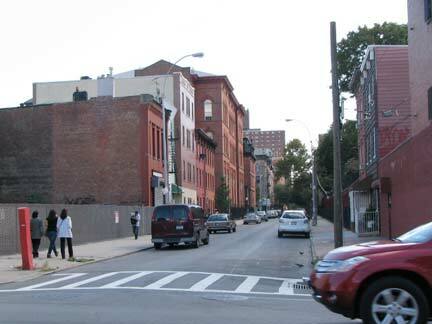 Clinton and Myrtle Avenues, northwest corner, 1969 and 2009. The whitewash has been removed, hallelujah. 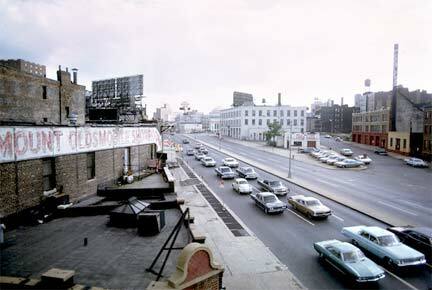 Chiseled into the side are the words Clinton and Myrtle — you can just make it out in the 1969 shot. 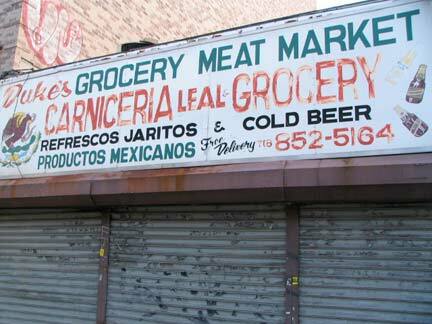 A butcher was on the ground floor in ’69 and a grocery is there now. 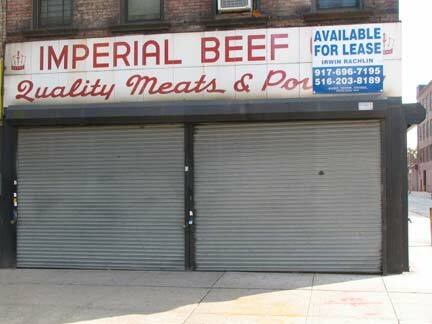 A look at the front of the same building — check out the vintage storefront signs. I should have zoomed in on those. 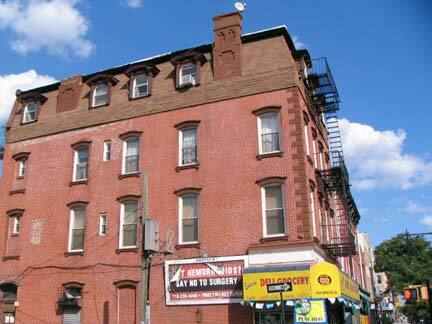 Southeast corner, Clinton and Myrtle, a stylish brick building from 1890-1910 with a corner turret. and a modern day view looking east. I’d have to say I liked the way the building looked in 1969 better, in brown and beige, opposed to the modern day whitewashing. 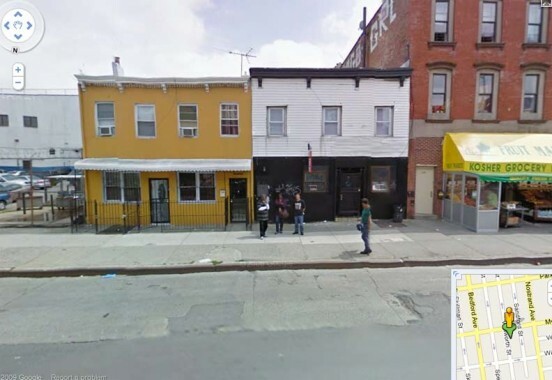 Southwest corner Hall Street and Myrtle Avenue, 1969 and 2009. A pizza place has replaced the “More and Better Fruit Stores.” If you’re inclined, walk south on Hall Street from Myrtle — there are some interesting post-bellum houses found there. 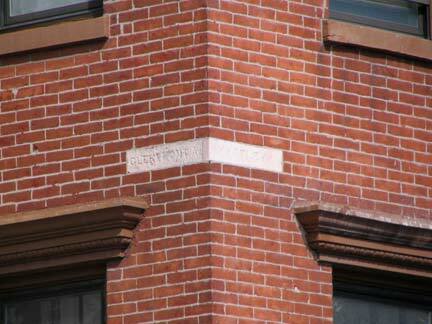 Hall street was named for the city of Brooklyn’s first mayor in 1834, George Hall. He served again from 1855-1856. Walt Whitman (1819-1892), author, poet, and abolitionist, was born in Huntington, Suffolk County, Long Island and died in Camden, NJ, but worked in Brooklyn during the early part his lengthy career, and lived in Brooklyn for 28 years. He edited the Brooklyn Daily Eagle between 1846-1848, advocating the creation of what became Fort Greene Park while there. 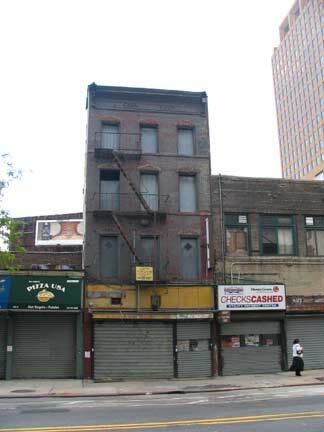 It is thought that the only one of Whitman’s NYC residences is still standing — this one at 99 Ryerson Street (center building) just north of Myrtle. While here in 1855, he completed the first draft of the work for which he is most celebrated, Leaves of Grass. 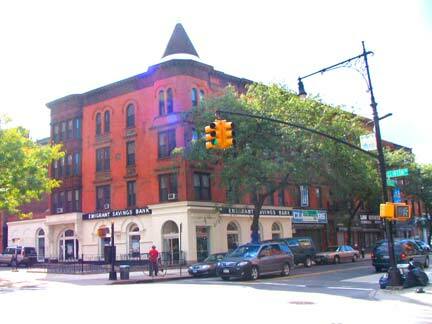 Though a library and housing project bear his name, Whitman is not memorialized by a statue or a street name in Brooklyn, and no plaque marks the building. 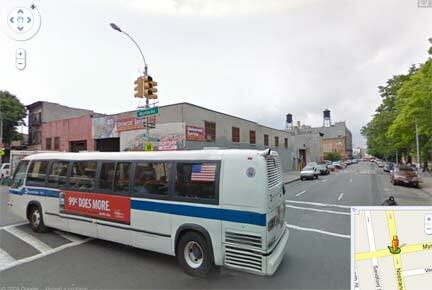 Myrtle Avenue widens somewhat on the south side of the street between Hall Street and Emerson Place. 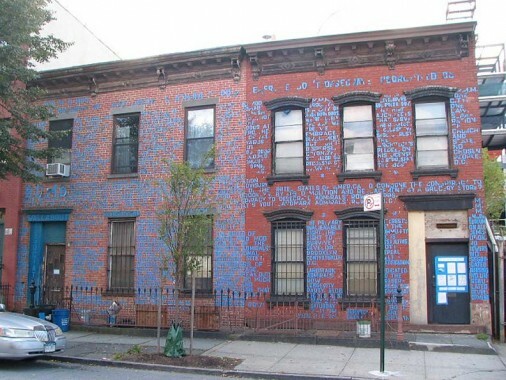 The Myrtle Avenue Revitalization Project is entertaining several ideas on how the pedestrian plaza can be improved. 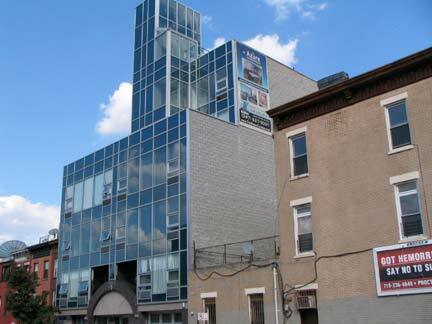 In photo: Pratt Institute bookshop at Myrtle and Emerson Place. 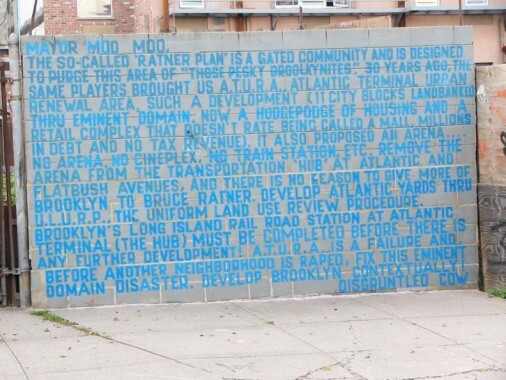 Check out Witter’s site linked above — he was present when the old LIRR terminal was demolished in 1988 and has several photos taken duing the teardown. 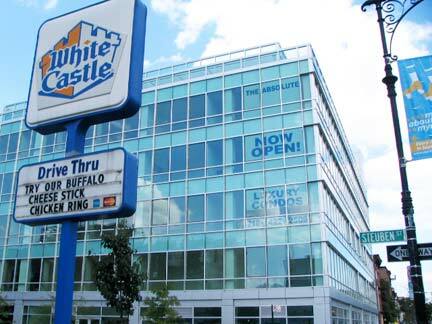 Hey, luxury condo-ites, you’ll be facing a White Castle, what you crave, through those big glass panes. No exhibitionism here like at The Standard in Manhattan — little kids eat here! Turning the corner, I found an old friend across from B.O.M.B. 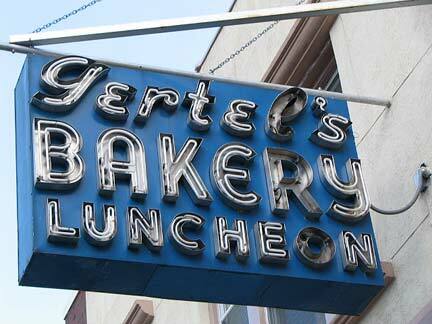 — the Gertel’s Bakery neon sign, formerly seen at 53 Hester Street in the Lower East Side until 2007 (the bakery had been there since 1914). It reopened in wholesale operations here in 2008, neon sign included. No lunch is served anymore though. 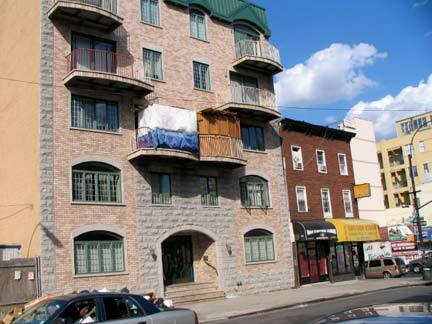 This building at Emerson Place quite resembles the one we saw earlier at Clinton Avenue. The street may be named for Whitman’s contemporary, Ralph Waldo Emerson, author and a founder of the transcendentalist philosophical movement. The Renken Company moved to Middlebury, CT in 1962. 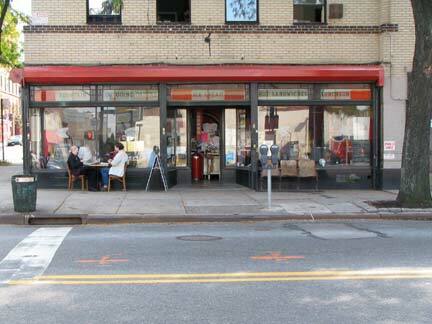 Wally’s Square Root Cafe occupied the ground floor in the Renken Building in September 2009. It features diner fare attracting students from nearby Pratt Institute. The diner follows the recent trend of not posting a sign, or just a very small one. 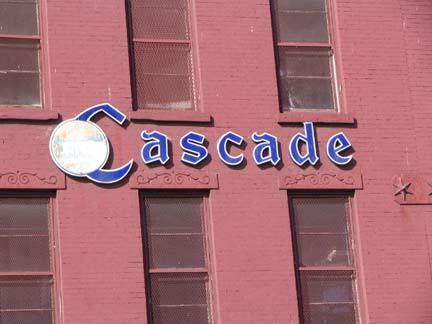 That way, only the hip cognoscenti will know about your exclusive place! 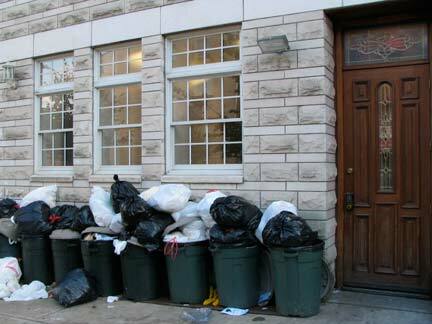 Scenes from Myrtle and Classon. Another glass condo seems to be giving the finger north of Myrtle. 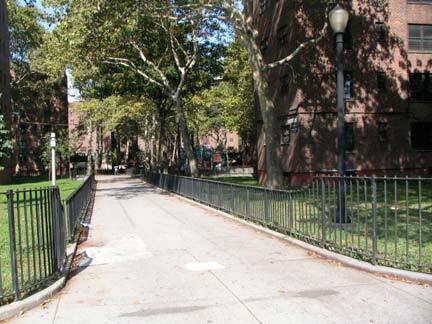 The east side of Classon and west side of Taaffe Place are lined by a brick fence emblazoned with crosses. 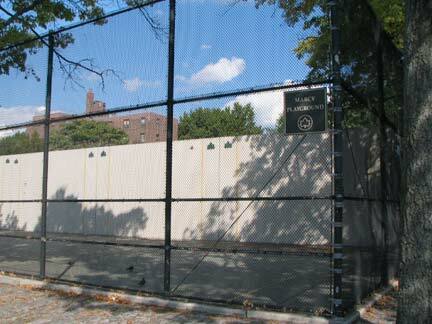 The fence protects the clositered Convent of the Sisters of Mercy located on Willoughby one block to the south. The convent, which opened in 1862, closed in 2009. 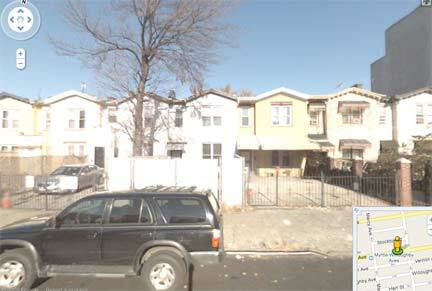 What will happen to the property was as yet undetermined in 2010. 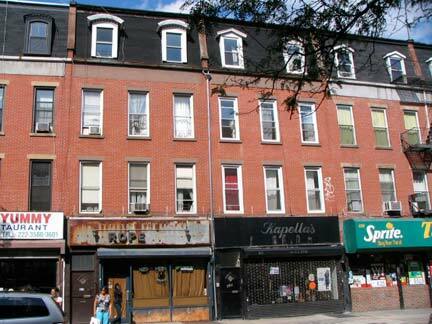 Taaffe Place, 1969 and 2010. 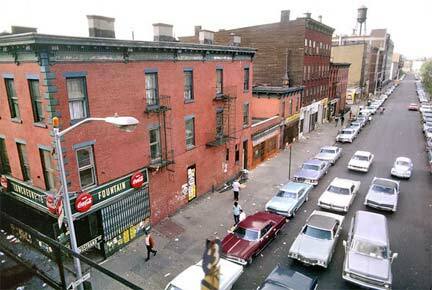 The building on the SW corner of Taaffe and Myrtle has been demolished, but the large building you see midblock in the 1969 photo is now the Taaffe Place Lofts. 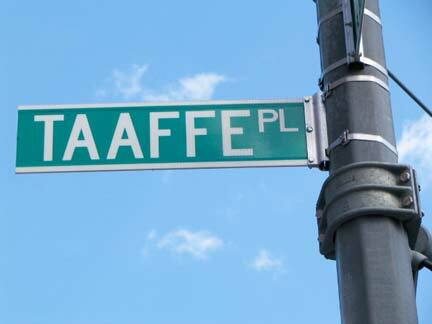 Taaffe Place Complex consists of four large buildings that were originally constructed in 1924. 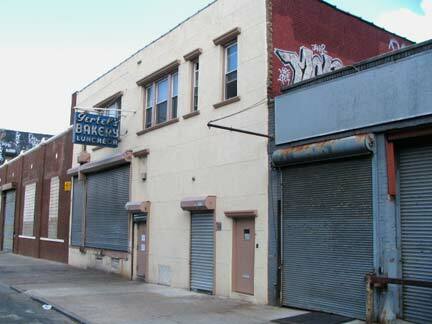 Over the last 30 years these warehouses were used by furniture and cabinet makers, as well as a knitting factory. I had always thought Taaffe was a Dutch name, but it is actually an Irish surname: it is an Irish transliteration of the Welsh equivalent of David (Dafydd), the patron saint of Wales. How is it pronounced? TAF, I’d imagine. 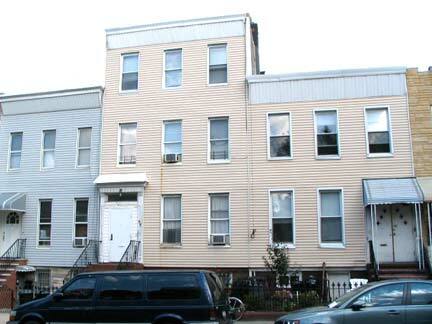 654 Myrtle Avenue just east of Franklin. 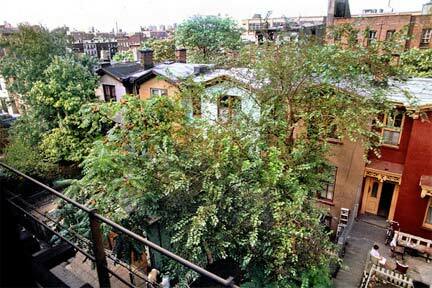 That pitch roof house with the sun deck must have a fascinating history. 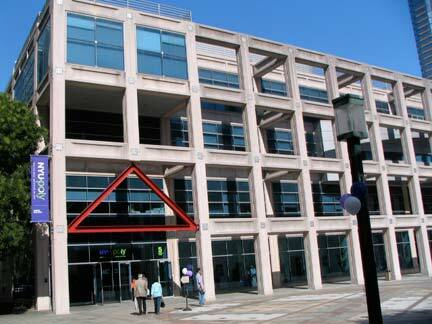 It’s unlike the rest of the buildings in this stretch and must be rather older. 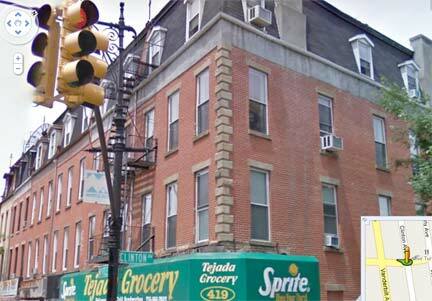 A grocery between Franklin and Bedford Avenues contains a rendering of a motif on the Mexican flag, although this version is reversed: the eagle holds the rattler in its right talon and faces left on the flag. 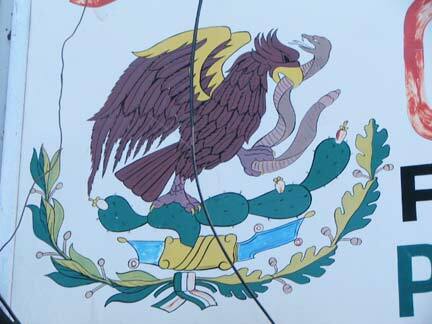 According to legend, the Aztec city of Tenochtitlan, now the site of Mexico City, was founded where the ancients found an eagle eating a serpent. 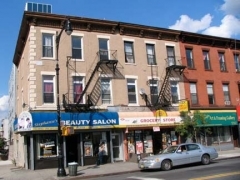 At Bedford Avenue, Myrtle Avenue’s residential housing temporarily suffers a downward turn as the inferior stylings of the 1990s and 2000s come into play. Bedford Avenue in this area, which FNY will soon explore at length, unfortunately has been given over to this sort of thing. 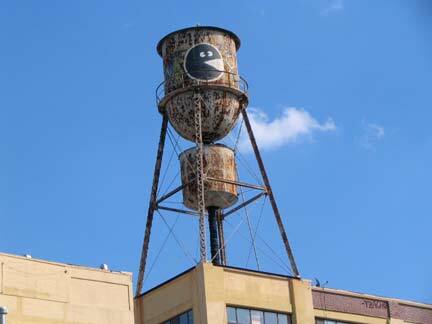 Pac-Man Fever lives on at this ancient water tower on Bedford just south of Myrtle. 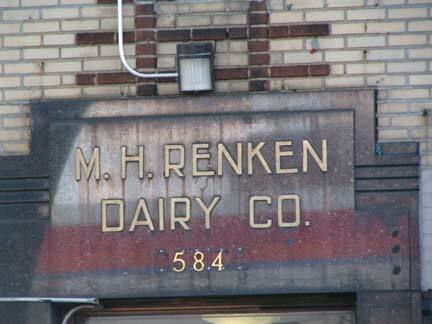 Terrific enamel sign on a butcher shop on the SE corner of Sandford Street and Myrtle. Looks like it won’t be here that much longer. A pair of low-slung houses between Walworth and Sandford that must date back close to the Civil War. 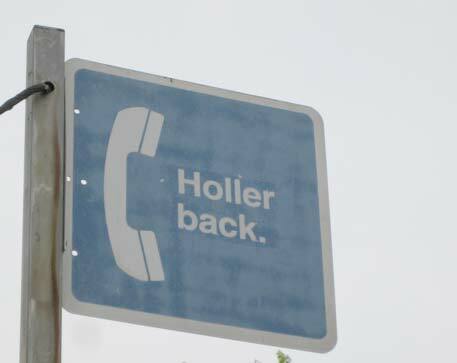 I didn’t notice it at first, but the pay phone at the corner has a nonstandard sign: a local mischief maker has changed it. Thanks to the blogger behind Antbed.com for locating it. Inscription, Nostrand Avenue at Bedford; Cubism revisited on the new residential building, and everywhere you go it’s Duane Reade. 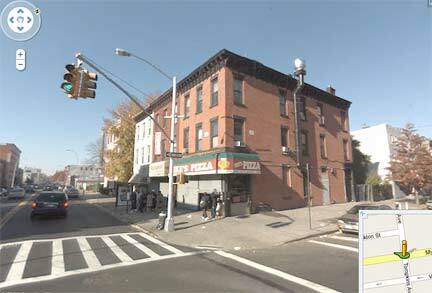 Nostrand Avenue and Myrtle Avenue, facing north, 1969 and 2009. The water tank up the street is the only thing remaining from 40 years ago. 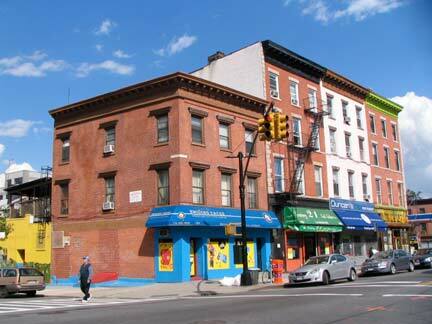 If you’re familiar with 1990s pop, you might be taken aback by Marcy Playground, facing Myrtle between Nostrand and Marcy Avenues. 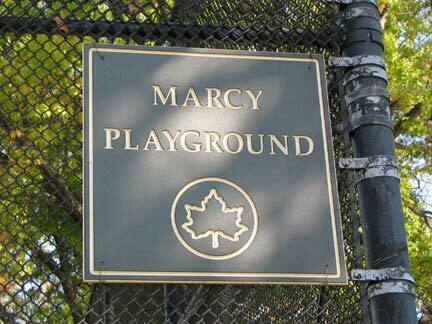 Of course, I figured this was where the band Marcy Playground took their name, but it’s merely coincidental, as the Minneapolis, MN based band, though formed in New York, is named for a playground at the Marcy Open School in the Marcy-Holmes neighborhood in Minny. 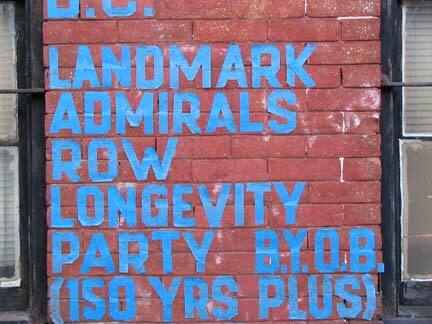 I’m not even sure they’ve been informed that a Brooklyn Marcy Playground exists. 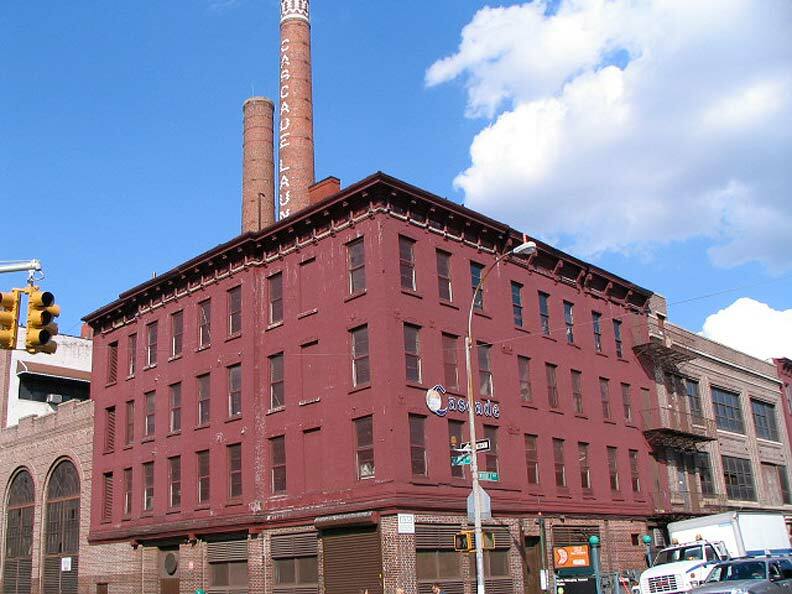 One of the few classic brick factory buildings still in industrial use is the Cascade Linen and Uniform suppliers at Marcy and Nostrand Avenues. 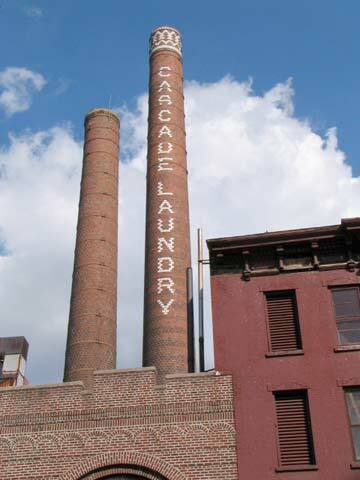 The smokestack’s lettering has not faded over time — the words are spelled out in white bricks against the red background. Briefly visiting the Myrtle-Willoughby IND subway that runs under Marcy Avenue, you can see classic IND lettering and metalwork stylings. This line serves the IND Crosstown G train, which never reaches Manhattan. In contrast to 1969 (top), these older homes with front yards on Myrtle between Marcy and Tompkins have lost most of their tree shading. (Indeed, most have been paved over for parking.) That bucks a trend toward more street trees. 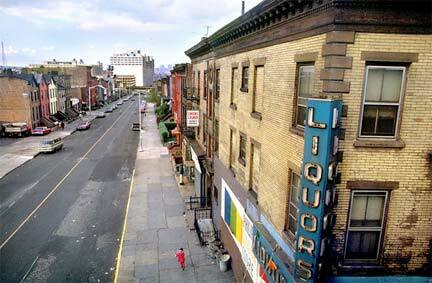 Myrtle Avenue and Tompkins Avenue, NW corner, 1969 (top) and 2009. 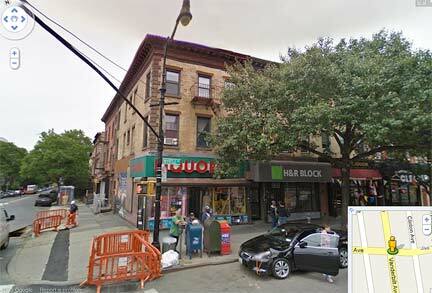 The drugstore on the corner is now a pizza place. 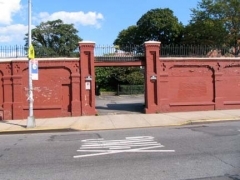 Upon reaching Lewis Avenue, we reach the el structure that will envelop Myrtle Avenue for the next few miles, and we’ll leave that for Myrtle Avenue Part 2. 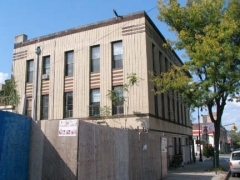 Once again, encomiums for Pat Cullinan, who got great color pictures of Myrtle Avenue el scenes shortly before it closed forever.